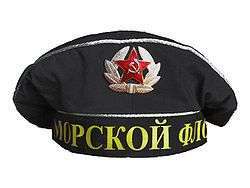 The Soviet Navy (Russian: Военно-морской флот СССР (ВМФ); Voyenno-morskoy flot SSSR (VMF), literally "Military Maritime Fleet of the USSR") was the naval arm of the Soviet Armed Forces. Often referred to as the Red Fleet, the Soviet Navy was a large part of the Soviet Union's strategic plan in the event of a conflict with the United States, the North Atlantic Treaty Organization (NATO), or another conflict related to the Warsaw Pact. The influence of the Soviet Navy played a large role in the Cold War, as the majority of conflicts centered on naval forces. Aurora was unofficially the first Soviet Navy vessel, after it mutinied against Imperial Russia in 1917. 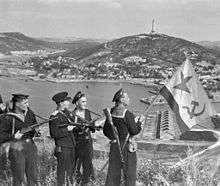 The Soviet Navy was based on a republican naval force formed from the remnants of the Imperial Russian Navy, which had been almost completely destroyed in the Revolution of 1917, the Russian Civil War, and the Kronstadt rebellion. During the revolution, sailors deserted their ships at will and generally neglected their duties. The officers were dispersed (some were killed by the Red Terror, some joined the "White" (anti-communist) armies, and others simply resigned) and most of the sailors left their ships. Work stopped in the shipyards, where uncompleted ships deteriorated rapidly. The Black Sea Fleet fared no better than the Baltic. The Bolshevik revolution entirely disrupted its personnel, with mass murders of officers; the ships were allowed to decay to unserviceability. At the end of April 1918, German troops entered Crimea and started to advance towards the Sevastopol naval base. The more effective ships were moved from Sevastopol to Novorossiysk where, after an ultimatum from Germany, they were scuttled by Vladimir Lenin's order. The ships remaining in Sevastopol were captured by the Germans and then, after November 1918, by the British. On 1 April 1919, when Red Army forces captured Crimea, the British squadron had to withdraw, but before leaving they damaged all the remaining battleships and sank thirteen new submarines. When the White Army captured Crimea in 1919, it rescued and reconditioned a few units. At the end of the civil war, Wrangel's fleet, a White fleet, moved to Bizerta in French Tunisia, where it was interned. 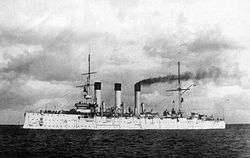 The first ship of the revolutionary navy could be considered the rebellious Imperial Russian cruiser Aurora, whose crew joined the Bolsheviks. Sailors of the Baltic fleet supplied the fighting force of the Bolsheviks during the October Revolution. Some imperial vessels continued to serve after the revolution, albeit with different names. 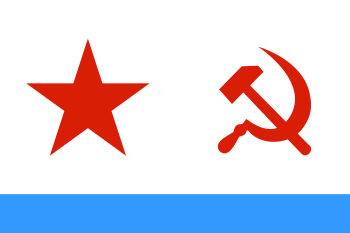 The Soviet Navy, established as the "Workers' and Peasants' Red Fleet" (Russian: Рабоче-Крестьянский Красный флот, Raboche-Krest'yansky Krasny Flot or RKKF) by a 1918 decree of the Soviet government, was less than service-ready during the interwar years. As the country's attentions were largely directed internally, the Navy did not have much funding or training. An indicator of its reputation was that the Soviets were not invited to participate in negotiations for the Washington Naval Treaty, which limited the size and capabilities of the most powerful navies. The greater part of the old fleet was sold by the Soviet government to Germany for scrap. In the Baltic Sea there remained only three much-neglected battleships, two cruisers, some ten destroyers, and a few submarines. Despite this state of affairs, the Baltic Fleet remained a significant naval formation, and the Black Sea Fleet also provided a basis for expansion. There also existed some thirty minor-waterways combat flotillas. Building a Soviet fleet was a national priority, but many senior officers were killed in purges in the late 1930s. The naval share of the national armaments budget fell from 11.5% in 1941 to 6.6% in 1944. When Germany invaded in 1941 and captured millions of soldiers, many sailors and naval guns were detached to reinforce the Red Army; these reassigned naval forces had especially significant roles on land in the battles for Odessa, Sevastopol, Stalingrad, Novorossiysk, Tuapse, and Leningrad. The Baltic fleet was blockaded in Leningrad and Kronstadt by minefields, but the submarines escaped. The surface fleet fought with the anti-aircraft defence of the city and bombarded German positions. The U.S. and Britain through Lend Lease gave the USSR ships with a total displacement of 810,000 tons. As post-war spoils, the Soviets received several Italian warships and much German naval engineering and architectural documentation. 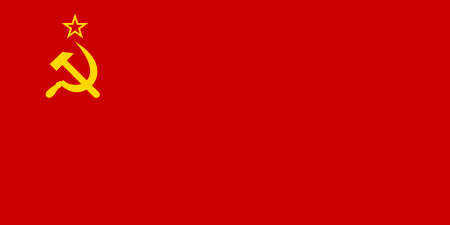 In February 1946 the Red Fleet was renamed the Soviet Navy (Russian: Советский Военно-Морской Флот, Sovyetsky Voyenno-Morskoy Flot), literally the Soviet Military Maritime Fleet. After the war, the Soviets concluded that they needed a navy that could disrupt supply lines, and display a small naval presence to the developing world. As the natural resources the Soviet Union needed were available on the Eurasian land mass, it did not need a navy to protect a large commercial fleet, as the western navies were configured to do. Later, countering seaborne nuclear delivery systems became another significant objective of the navy, and an impetus for expansion. 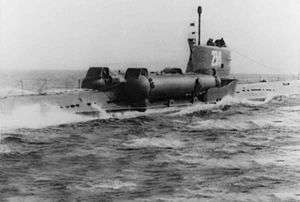 The Soviet Navy was structured around submarines and small, maneuverable, tactical vessels. The Soviet shipbuilding program kept yards busy constructing submarines based upon World War II German Kriegsmarine designs, which were launched with great frequency during the immediate post-war years. 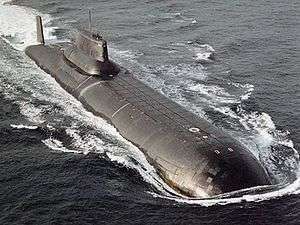 Afterwards, through a combination of indigenous research and technology obtained through espionage from Nazi Germany and the Western nations, the Soviets gradually improved their submarine designs, though they initially lagged the NATO countries by a decade or two. Large carriers were not needed to support the naval strategy of disrupting sea lines of communication. Moreover, among the armed services the Navy was lowest in priority in the consideration of the Party's management. Premiers Nikita Khrushchev and Leonid Brezhnev considered aircraft carriers overly expensive, time-consuming, and vulnerable to attack. During the 1970s the Soviets began Project 1153 Orel ('Eagle'), whose stated purpose was to create an aircraft carrier capable of basing fixed-wing fighter aircraft in defense of the deployed fleet. The project was canceled during the planning stages when strategic priorities shifted once more. It was during the 1980s that the Soviet Navy acquired its first true aircraft carrier, Tbilisi, subsequently renamed Admiral of the Fleet of the Soviet Union Kuznetsov, which carries Sukhoi Su-33 'Flanker-D' and MiG-29 fighters, and Ka-27 helicopters. A distinctive feature of Soviet aircraft carriers has been their offensive missile armament (as well as long-range anti-aircraft warfare armament), again representing a fleet-defense operational concept, in distinction to the Western emphasis on shore-strike missions from distant deployment. 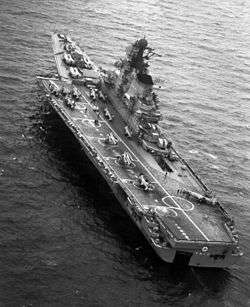 A second carrier (pre-commissioning name Varyag) was under construction when the Soviet Union disintegrated. Construction stopped and the ship was sold, incomplete, to China by Ukraine. It was commissioned into the People's Liberation Army Navy in 2012 as Liaoning. In part to perform the functions usual to carrier-borne aircraft, the Soviet Navy deployed large numbers of strategic bombers in a maritime role, with the Aviatsiya Voenno-Morskogo Flota (AV-MF, or Naval Aviation service). Strategic bombers like the Tupolev Tu-16 'Badger' and Tu-22M 'Backfire' were deployed with high-speed anti-shipping missiles. The primary role of these aircraft was the interception of NATO supply convoys traveling the sea lines of communication between Europe and North America, and thus countering Operation REFORGER. Victor III class was the primary nuclear attack submarine of the Soviet Navy. ↑ Boris V. Sokolov, "The role of lend-lease in Soviet military efforts, 1941–1945," Journal of Slavic Military Studies (1994) 7#3 pp: 567–586. 1 2 3 4 5 6 Congressional Research Service (October 1976). 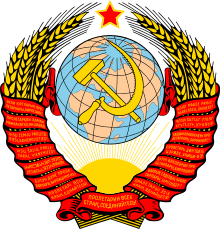 "Soviet Oceans Development". 94th Congress, 2nd session. U.S. Government Printing Office. 69-315 WASHINGTON : 1976. Retrieved 23 April 2013. ↑ "Soviet Navy Ships - 1945-1990 - Cold War". GlobalSecurity.org. ↑ Military ranks were abolished in 1918–1935. 1 2 A naval rank from 1935. ↑ Fleet Flag-officer 2nd Rank from 17 January 1938, Admiral (June 1940), Admiral of the Fleet (February 1944), Rear Admiral (1948), Admiral of the Fleet (1953), Admiral of the Fleet of the Soviet Union (March 1955), Vice-Admiral (February 1956), Admiral of the Fleet of the Soviet Union (1988, posthumous).